Turtles are very popular pets and can be terrific for people who want a fascinating animal to look at and appreciate — but maybe not necessarily to cuddle with. Turtles can be great for families with elementary school-age children and older, but not ideal for families with very young kids who might drop them, forget to feed them or forget to wash their hands after handling them (there is a very important reason why — keep reading!). 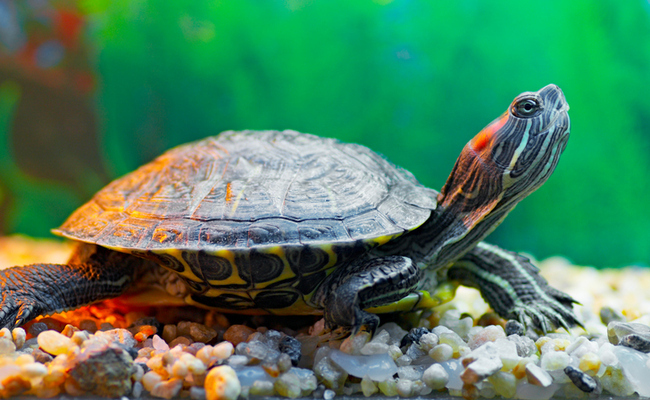 If you are thinking of getting a turtle as a pet, here are some interesting facts about them that you may not know. Tortoises — as distinct from turtles — all live on land, but did you know not all turtles live in water? Some turtles, such as several species of box turtles, need access to water to stay hydrated but spend most of their time living on dry land. People tend to use the terms “turtle” and “tortoise” interchangeably, but actually they are very different animals. Turtles, who mostly swim in water, typically have webbed feet, while tortoises have defined toes. Also, many turtles are omnivores, meaning they eat both plant and animal material, while the majority of tortoises are vegetarians. Many turtles, when housed at the right temperature and humidity, exposed to ultraviolet light, and fed a species-appropriate diet, can live for decades. Many of my chelonian (another word for turtle) patients, in fact, outlive their original owners and are passed from generation to generation within families. Their longevity is certainly something for a potential owner to consider before bringing a turtle into the home. Salmonella is a species of bacteria that many reptiles, but especially turtles, can carry normally in their intestinal tracts and are unaffected by it. They shed this bacteria in their stool intermittently. In people and other mammals, such as pet cats and dogs, this bacteria can cause horrible gastrointestinal problems, such as severe vomiting and diarrhea. That’s why it is critical that anyone who handles a turtle, its droppings or the objects in its tank washes their hands afterward. This is particularly important when children, who often put their hands in their mouths, handle reptiles. It is also the main reason why turtles are not recommended as pets for families with very young children. In addition to rigorous hand washing, I remind all the families whose turtles I treat to keep a pump bottle of hand disinfectant right next to the tank. With many exotic pets, it’s not always easy to know if you’ve got a boy or a girl, but in turtles, there are a couple of ways. One good rule of thumb for telling the difference between males and females is that males have longer tails, and their rectal opening — called the vent — is further down the length of their tail than in females. In girl turtles, the vent is much closer to the shell. Some species of turtles also show other differences between males and females, such as distinct shell shapes (the bottom shell, or plastron, in males may be curved inward so they can mount females for reproduction) or eye color (males’ eyes may be a brighter red than the brown eyes of females). Some male turtles also have longer nails than females. Like chickens, female turtles can lay eggs without a male turtle being around to fertilize them — although these infertile eggs won’t hatch. Many wild turtles lay eggs in the spring in response to temperature and light cycle changes; that’s why we see so many turtles out on the roads when warmer weather hits. They are on a search to find sandy or soft soil in which to dig and bury their eggs. Pet turtles, however, often do not follow these seasonal rules as their environments do not change significantly and they can lay eggs year-round. Turtles typically live in rectangular tanks filled with water, as they spend most of their time swimming. Yet even aquatic turtles need to dry off sometimes. So all turtles should have a basking area in their tanks — typically a large rock — where they can climb up and hang out. But also keep in mind that turtles love to eat rocks, so make sure that all rocks in the tank (including any gravel in the bottom or that is used for basking areas) are bigger than your turtle’s head in order to prevent inadvertent snacking. Rocks can cause a gastrointestinal tract obstruction. Most turtle breeders will tell you that, as a general rule of thumb, turtle tanks need to be five times the length of an adult turtle and contain water that is two and a half times as deep as the turtle is long. The bigger the turtle, the bigger the tank and the greater the volume of water required. A powerful filter is also required to keep all that water clean, as turtles both eat and defecate where they live. The filter needs to be changed regularly depending on the size of the tank and the number of turtles it houses (your veterinarian should be able to advise you on a preferred schedule). Turtles have a high requirement for vitamin A in their diets as they do not store this vitamin in their bodies. As a result, they need to get it from their food. Great dietary sources of vitamin A for turtles, depending on their species, include dark leafy green vegetables and red, orange or yellow veggies, such as bell peppers and squash. Without adequate vitamin A, many turtles will develop swollen eyelids and have difficulty seeing. If your turtle develops these signs, be sure to have him examined by a turtle-savvy veterinarian. 9. Turtles Know Their Owners! Most people don’t realize this, but many turtles recognize the sight and sounds of their owners! In fact, many owners comment how their pets swim right up to the water surface to greet them when they walk in the room. You might not expect it, but your turtle may actually come to you when you call him! Turtles can be phenomenal pets if you are willing to take the time to set up and maintain their environments properly and feed them according to their species-specific needs. And remember, just like our furry friends, turtles also need routine veterinary care as well. Most importantly, if you find out that a pet turtle is not for you, please don’t release it into the wild. Many pet turtle species are not meant to live in the wild and will die without care or can introduce diseases that can sicken wild turtles. There are plenty of animal shelters or turtle rescues that will take in an unwanted pet. Though not every owner wants a pet that is as labor intensive as a turtle, when they are healthy, as you can see from these fascinating facts, turtles can be tremendously terrific to have around! Turtles are beautiful, I've loved them since I was a kid. I have 3 turtles; they are very happy in the patio with food and access to water all the time. One of them is 20 years old! If you have a turtle treat it right as with any pet! Before adopting any animal, make sure you have time to care for them. Great article! I've wanted a turtle as a pet for a while, but I would only ever adopt a turtle if I knew 100% how to take care of them and give them a good, long life! Just don't. Reptiles in general have very specific lighting, heating, water and food requirements and those who don't understand that - which is probably most of those who either sell them or want them - contribute to some very, very sick animals who have a very poor quality of life. Turtles, tortoises and terrapins need to be left in the wild where they belong. Leaving them there also helps damp down the illegal wildlife trade and the plethora of animal welfare issues inherent in getting them into, and keeping them in, pet stores. Turtles and tortoises are fascinating but, like any animal, you _need_ to know how to properly care for them so you won't be inadvertently cruel. I agree with Wesley, don't adopt these sweet creatures. Several decades ago the little turtles were banned, couldn't be sold in Calif. but I don't know if that is still true today. It should be.